Now I could see why you'd run out of unique filenames - there are only 26 letters in the alphabet and these filenames were only three letters long. Also, they all seemed to begin with the letter "x". each file into which the file is split is named by the prefix followed by a lexically ordered suffix using suffix_length characters in the range 'a-z'. If -a is not specified, two letters are used as the suffix....with the prefix 'x' and with suffixes as above. Got it, so running split with the defaults for prefix name and suffix length will give me filenames that always start with the letter "x" followed by two-letter alphabetical permutations composed of a-z letters, with repeats allowed. I say "repeats allowed" because I noticed filenames such as xaa and xbb in the output. Side node: The reason why I say "permutations" rather than "combinations" is because letter order matters. For example, xab and xba are two distinct and legitimate filenames. Here's a nice explanation about the difference between permutations and combinations. n^r where n equals the number of possible values (26 for a-z) and r equals the number of values (2, since there are only 2 letters after "x" in the filename). So the total number of filename permutations allowed with BSD split's defaults should be 676. While 26^2 permutations doesn't support 4000 different filenames, I wondered if I could increase r to 3. Then, I'd have 17,576 different filename permutations to play with - more than enough. In fact, I vaguely remember splitting large files into smaller ones with numerical filenames, which I prefer. I also remember not having to worry about suffixes in the past. But numerical filenames didn't seem to be an option with split installed on Mac OS X - there was no mention of it in the manual. You can snag the GNU version of several command-line utilities using brew install coreutils. For further reading, there are other articles out there comparing more BSD and GNU commands differences like grep and sed. By default, the new commands are installed with a "g" prefix, so I ran gsplit -l1 input.txt to try it out. No errors! GNU split automatically adjusts the filename suffix length so that I have enough to cover 4000 filenames. 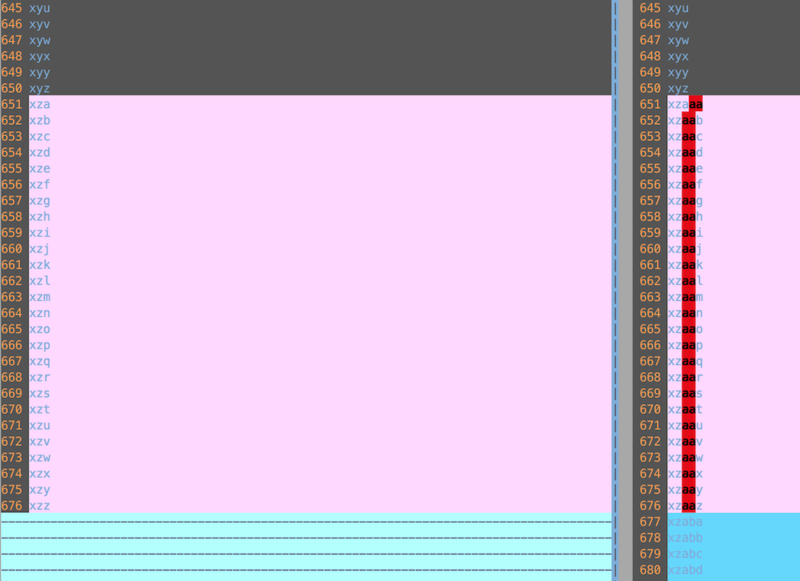 But when I used vimdiff to compare the manifests, I noticed something a little odd. While gsplit's permutations contained three-letter filenames starting with x, vimdiff immediately highlighted 26 missing three-letter permutations: xza-xzz. Weird! My assumption was that gsplit somehow knew that it was about to run out of name permutations 26 files in advance, so at 26^r - 26. Then it would preemptively switch to using a new two-letter prefix "xz" with longer, three-letter suffixes. The new pattern would accommodate a total of 17,576 filenames (26^3). Nothing in man gsplit described this automatic prefix and suffix length increase, so I decided to keep playing around. I created a directory called moar_gsplit_permutations and a much larger input file that was 456,977 lines long, one more than 26^4 permutations. I wanted to check the filenames at 26^3 - 26 and again at 26^4 - 26 to see if the filenames got longer. I wandered off to get a snack. The gsplit took nearly 9 minutes to run and generated 1.7 GB of files. I opened up sorted_filenames.txt and jumped to line 650, to see if the three-letter filenames got exhausted early like before. They did! If the pattern holds, then the next increase in filename prefixes and suffixes should happen at line 17550, which is 26 fewer than 26^3 permutations. Bingo! After line 17550, the filenames shift to xzzaaaa..., with "xzz" as the prefix and a four-letter suffix. Next, I jumped to line 456950, which is 26^n - 26. Yet again, there is a pattern shift, where both the prefix and suffix each gain a letter. In summary, gsplit's default file naming behavior is to add a letter to the prefix and suffix of a filename whenever it reaches 26^r - 26 files (with r being the current length of the suffix), so you don't need to worry about running out of filenames (just disk space, haha). I'm sure someone somewhere has already written about this default naming behavior before, but it was really fun to go through the process and figure out how the naming worked. Getting out of my numeric naming comfort zone gave me a chance to experiment with the default lexical (alphabetic) naming, which turned out to be really interesting!